We landed back in Charlotte to bring together guests for Pennzoil’s third anchor event of the year after the Pennzoil 400 and Indy 500. This time around was full of excitement as we were ready to experience the first ever NASCAR Cup race on the Charlotte Road Course, or the ROVAL. According to SportsBusiness Journal, the race earned 3.218 million viewers for Sunday's Bank of America ROVAL 400, up 11% from 2.89 million for last year's race. Sunday's event marked the most significant ratings increase for a NASCAR Cup Series race this year. Our guests also seemed to love the new race format, giving it a 4.8/5 star rating on our feedback survey. Scroll through the interactive recap to relive the event. When we come to Charlotte, we always look for additional ways to add value and uniqueness to the guest experience. Since we were in NASCAR’s hub, full of race shops and studios, we treated our guests to a behind the scenes, exclusive tour of the 400,000 square foot Team Penske shop. After the tour, we came back to the hotel and got ready for a special dinner. Motorsport events make for a perfect venue for connecting with colleagues, customers and guests so it is always nice to have some time together away from the track. Team Penske drivers and Pennzoil ambassadors Joey Logano and Ryan Blaney stopped by for some fun in the NASCAR simulators and shared with our guests their strategy for taking on the first-ever running of the Charlotte ROVAL road course. As it turns out, guests were treated with hearing the winning strategy ahead of the event from eventual race winner Ryan Blaney. You can’t get much closer to the team than that. Race day - what we have all been waiting for! It was clear there was a special buzz in the air for this event, the first time anyone had seen a NASCAR Cup race on the Charlotte Road Course. Guests were treated to a garage and pit tour where they saw the final preparations of the race and got to have a chat with Team Penske engineers, drivers, spotters and more. We always love running into the Fuel For Success kids, a highly engaged group of youth led by Officer Todd Smith. This time around, they got to sit in the media center with Joey Logano, learn from race engineers about what it takes to success at the highest level of motorsport, and more. By far the coolest experience of them all, was heading down to Victory Lane to celebrate the inaugural ROVAL victory with race winner Ryan Blaney. Guests got to soak in all of the celebrations as part of the team, and of course spend some time with everyone for a group photo. What better way to reach your audience than by taking them directly to the center of the action? 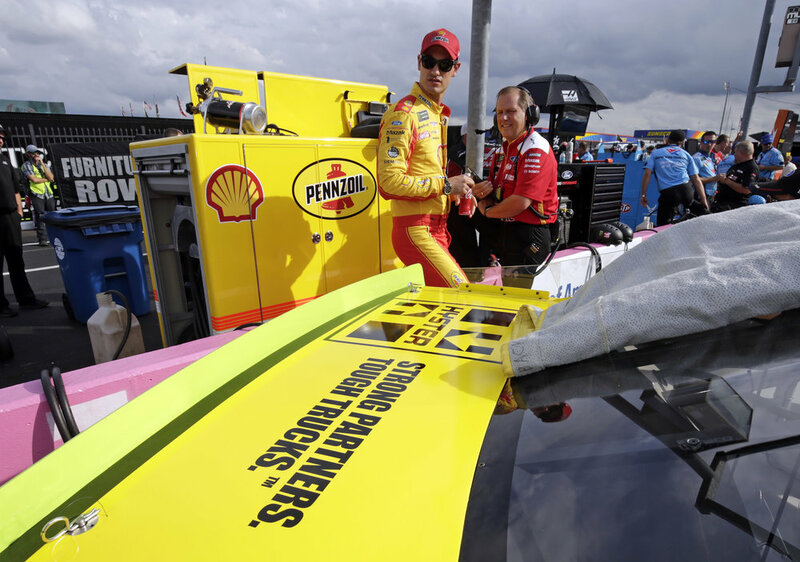 We hosted 4 influencers for the weekend and showed them the difference Pennzoil makes for Team Penske in NASCAR. Motorcity Mechanic takes us through a lesson on the new ROVAL layout in Charlotte. In an effort to continually improve guest experience, we issued a digital survey delivered to guests the Monday after the race along with a downloadable photo album for them to enjoy. See here for the highlights, and click the button below for a more in-depth look at the results. Just wanted to send you a quick note to say thank you for a GREAT race day event yesterday! Thanks to you and the entire Sport Dimensions team we had another over-the-top weekend. Please be sure to let the entire SD team know how much we appreciated their time and hospitality! Our Hyster logo looked great on the #22 trunk deck!